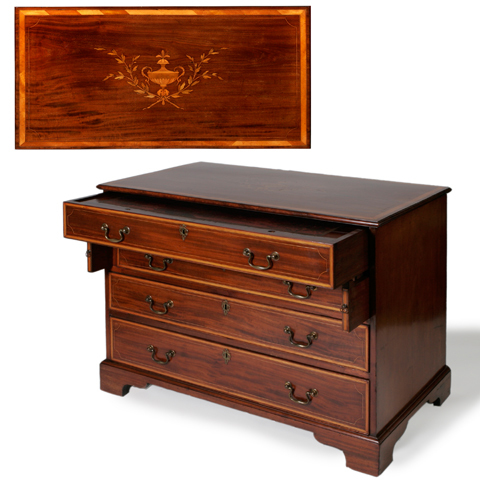 18th C - circa 1780 - English George III fine mahogany chest of drawers with secrétaire drawer. Fine contrasting satin wood cross-banding. Later urn and foliate trophy inlaid top. Very good color of slightly faded Honduran mahogany. Strong oak drawer linings with old locks. Old, possibly original, leather writing surface. 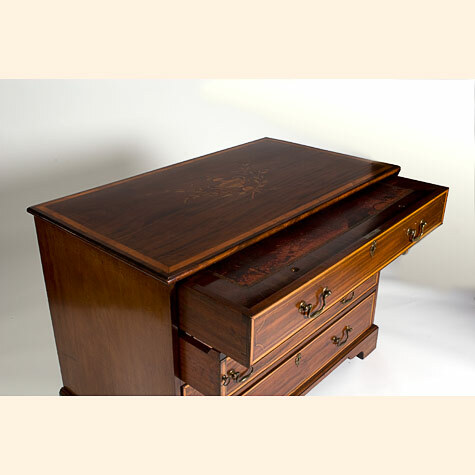 Drawer divided into three compartments. Reduced in height. Some alterations and veneer repairs. Pull out secrétaire is 29.5 inches, with 24.5 inches of leg room below.